Over the past 30 years, the top 1% of the United States has experienced a 240% increase in its real annual income, while that of the median household has barely budged. Imagine if this explosive, decades-long growth of inequality were somehow reversed—and reversed at an even faster rate than its original expansion. This is, in fact, what has happened in Venezuela, and it goes a long way toward explaining why President Hugo Chávez was re-elected in October, despite many pundits’ predictions of a victory by opposition leader Henrique Capriles. The likelihood of coming across an accurate assessment of Venezuela’s social and economic advances in the media, however, is about as small as the odds of encountering honest portrayals of that country’s elections. It’s difficult, for instance, to find any mention in the media of the Gini index for the United States or Venezuela. A standard measure of income inequality, it ranges from 0 (perfect equality) to 100 (perfect inequality). According to the Luxembourg Income Study, the Gini index for the United States was 29.9 in 1979. By 2010, it had shot up by more than 7 points to 37.3. Contrast this with Venezuela: the country’s Gini index in 1997, the year before Chávez was elected, stood at 50.7; in 13 short years, it had fallen by over 11 points to 39.4, according to United Nations data for 2010. 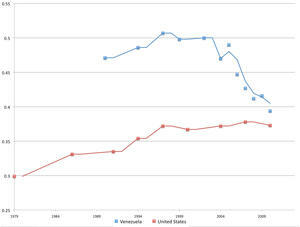 Gini coefficients of Venezuela and U.S. This rapid reduction of inequality is largely a result of the Chávez administration’s policy of promoting broadly shared economic growth. Having cut both poverty and unemployment by half over roughly a decade, Venezuela is now the least unequal country in Latin America, according to the UN. The poverty and inequality statistics are based only on cash income. But Chávez also introduced a suite of oil-financed social programs that provide free healthcare, education, housing, and subsidized food, among other benefits. Their effects include substantial reductions in infant mortality and the doubling of the country’s college enrollment. Chávez’s social and economic agenda has also helped him to win 14 of 15 elections or referenda despite the inevitable voter fatigue that develops toward any incumbent over 14 years in office. On October 7, Chávez won by an 11-point margin in an election process described by Jimmy Carter as “the best in the world.” This suggests that for voters, continued advancements in well-being have outweighed ongoing problems like crime and inadequate infrastructure. The paradigm that has emerged during Chávez’s presidency is threatening to the dominant political discourse in the United States for two related reasons. First, it demonstrates that poverty and inequality, far from being implacable economic phenomena, are primarily political issues, and can be successfully tackled through aggressive public policy. Second, a governmental commitment to improving the general public’s living standards engenders a new kind of politics, distinct from the consensus that prevails under a decades-old regime of ever-increasing economic polarization. The era that preceded Chávez’s 1998 election has echoes of the current predicament of U.S. politics—two major parties with fairly similar agendas took turns managing the country’s governmental institutions while elites controlled the country’s resources. Venezuela’s democracy, like much of Latin America’s, has meant a break with that past. The U.S. press helps to enforce the status quo in a country whose majority has faced declining living standards in recent years, largely as a result of policies furthered by a bipartisan political system. So it’s not surprising to see the U.S. media’s hostile reactions to the politics of Venezuela, where citizens expect their votes to translate into genuine improvements in their daily lives—and politicians must deliver on those expectations. A version of this piece will appear in the December issue of Extra!, a publication of the media watchgroup FAIR. Keane Bhatt is an activist in Washington, D.C. He has worked in the United States and Latin America on a variety of campaigns related to community development and social justice. His analyses and opinions have appeared in a range of outlets, including NPR, The Nation, The St. Petersburg Times and CNN En Español. He is the author of the NACLA blog “Manufacturing Contempt,” which critically analyzes the U.S. press and its portrayal of the hemisphere. Follow his blog on Twitter @KeaneBhatt.